Adalah – The Legal Center for Arab Minority Rights in Israel and Al-Mezan Centre for Human Rights submitted yesterday, 16 May 2018, a motion to the Israeli Supreme Court demanding that it issue an immediate final decision on the organizations’ joint petition against the Israeli military’s use of live ammunition and sniper fire on unarmed civilian protesters in Gaza. In addition, Adalah and Al Mezan are releasing today a briefing paper that takes an in-depth look at the petition challenging the Israeli military’s use of lethal force against Gaza protesters, as well as the State of Israel’s response, and our critique and arguments against the State’s positions. Adalah and Al Mezan argued in the motion that, since filing the petition, an excessive amount of time has passed, during which a large number of Palestinian unarmed protesters have been killed and wounded in Gaza demonstrations. Every week, the Israeli military has responded to the protests near the Gaza fence with lethal and other excessive force, which has resulted to date in the killing of 86 protesters, including 12 children, two journalists, and the injury of approximately 11,000. In the single bloodiest day of the seven weeks, 14 May 2018, the Israeli military killed 59 Palestinians, including 43 protesters during demonstrations, of whom seven were children and one a person with disability. At least another 2,771 persons were injured, including 225 children, 12 journalists, and 17 paramedics—1,359 of whom by live ammunition. 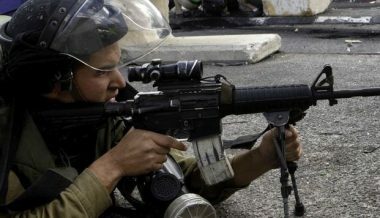 The Israeli military’s open-fire policy is illegal. The military informed the Supreme Court that it shoots people in Gaza who are allegedly “leading inciters or breachers of order”; they did not claim that the people shot were armed or that they posed an immediate threat to the lives of others. This is a violation of international law, amounting to willful killing and injury, and constituting war crimes under Article 8 of the Rome Statute. Adalah and Al Mezan demand the Israeli Supreme Court issue an immediate ruling that the Israeli military’s open-fire policy in Gaza is illegal.